Today held many new learning experiences of which we all took part within different groups. Along with meeting great new people we’ve had a wonderful time sampling the slightly overpriced food, and enjoying the cold weather. The people here are quite intrigued to find that we are from Hawaii, “and I guess if I had to live in this ever changing weather I would look forward to Hawaii as well”. All of the students in this program have been engaged in many historical debates that have resulted in rather stimulating arguments that leave one or both sides with the feeling of victory. Our first trip was to the House of Representatives where we lingered outside and marveled at its magnificence. Our director, “an enthusiastic woman bent on keeping us engaged,” ran through an immense amount of information regarding every landmark we came to. Second, we came to the Holocaust Museum where we were able to walk through a guided maze of posters, machines, videos, and people. It was quite the humbling experience, learning of this tragic event that took place in history. After the Holocaust Museum tour we went to a food court and ate for about an hour. Then we proceeded to go to the World War II Memorial. There we were able to see a gorgeous fountain set up to enhance the experience of seeing each state represented on the walls. Soon after we headed to the Vietnam Memorial and the nearby Korean War Memorial. Seeing the life-like statues and seemingly endless names of soldiers lost in the wars brought about many mixed emotions to all of us. The highlight of today was going to the Abraham Lincoln Memorial. The sheer brilliance of Lincoln portrayed in this massive marble statue is utterly breathtaking. 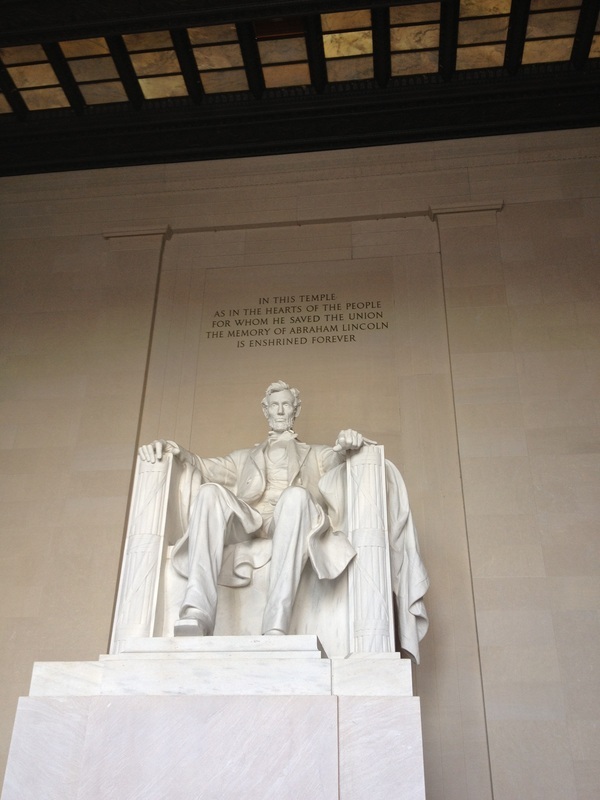 Within the Lincoln Memorial there are some of his most famous writings and speeches. After a long day we were directed back to the buses and taken to our hotel. We were given about an hour and a half to relax and get ready for our dinner and final workshop of the day. When the workshop of debate ends at ten we are allowed to walk about the hotel until room check at 11:00 pm. And that’s it till the next day when we have to get up for breakfast at 7:15 a.m.